The history of Los Realejos dates back to slightly over 500 years, in the times of the Spanish Conquest, when the territory was divided into two areas that eventually formed the municipalities of Realejo Alto and Realejo Bajo. The strategic distribution of the two armies –the Castilian and the “guanche” armies- determined this division. The distribution of the two armies defined the name of the territory, so that the area where the Spanish conquerors built their camp was called Realejo de Arriba, whilst the area where the aboriginal ‘guanches’ settled was called Realejo de Abajo. 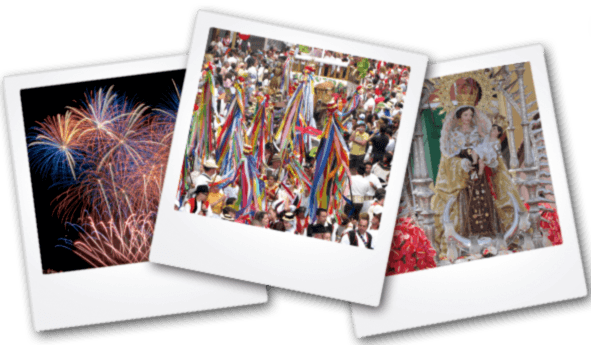 On the morning of July 25th, the day of the festivity of Santiago [Saint James], the five Guanche kings –Bencomo, Beneharo, Acaymo, Tegueste and Zebenzui- crossed the ravine separating the two camps. The Castilian general and his first officers came to meet them, bearing flying flags, drums and bugles, and gave Bencomo an affectionate hug. The surrender of ‘guanches’ to the Castilian troops brought the Spanish Conquest to a close and meant the incorporation of the Canary Islands into the Kingdom of Castile. From the day the two municipalities were founded, they remained under the jurisdiction of La Laguna. It wasn’t until the 19th century that the municipalities became independent, under the Decree of the Court of Cadiz of May 23rd 1812, church jurisdiction and a Council, which was created in 1778 for that purpose. On March 18th 1952, the mayors of both municipalities –Mr Nicolás González del Carmen, mayor of Realejo Alto, and Mr Óscar González Siverio, mayor of Realejo Bajo- agree to initiate the fusion and forward this proposal to the Council of Ministers, which obtained a ruling in favour. Thus, on January 6th 1955, Official Spanish Gazette published the merging of the two municipalities into a single new municipality: Los Realejos.